In beautiful Piazza Arringo, where the Forum rose in Roman times, there is the Pinacoteca Civica, one of the richest collection of religious art in Italy including works by Cola dell'Amatrice, Carlo Crivelli, Titian and Guido Reni. In the same square the Duomo dedicated to St Emidio, Patron of Ascoli and deeply worshipped all over central Italy as a protector against earthquakes, which hosts a precious polyptich, a masterpiece by Carlo Crivelli and a silver altar piece in 27 tiles representing Christ's life. The painter born in Bologna, Guido Reni, enjoyed the highest reputation during his life time and throughout the 17th and 18th centuries, until Ruskin demolished his reputation for his sentimental religiosity. Nevertheless, he remains the one of the great painters of the Counter-Reformation. 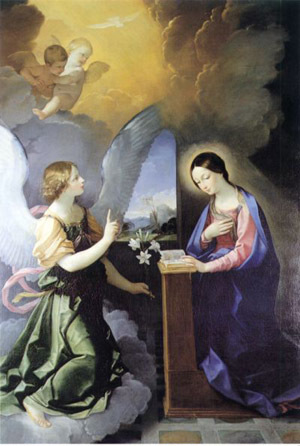 After his painting of the Annunciation in 1621 (see picture) for the church of San Pietro in Valle, Fano (now in the city's Pinacoteca Civica), he was commissioned by the Marchesa Alvitretti to paint this second picture on the same theme for her family chapel at the Chiesa della Caritá in Ascoli Piceno. Its use of bright luminous colours and formal harmony looks forward to a new classical style which Reni began to develop by the 1630s. The angel Gabriel appears on a cloud and a shaft of bright light beams down upon the Virgin from Heaven; yet Mary remains reading at her prie-dieu, as if the scene depicted in front of her is an inner revelation.